Read many of the bird books and the general consensus is that the Striated Pardalotes migrate across Bass Strait to mainland Australia for the Winter. However, from my observations of recent years, increasing numbers don't. Perhaps we might put this down to global warming, but standing, watching and photographing the accompanying birds a few days ago, there was a noticeable lack of any warming! I had gone to the nearby grounds of the old gun battery atop Bellerive Bluff. These grounds afforded an excellent view of the snow covered flanks of Mt. Wellington, but this was n't a day to stand around admiring the view, as there was a stiff westerly blowing and a temperature around 4C. My first sighting on arrival was the resident pair of Yellow Wattlebirds, giving their guttural contact call as they independently feed in the tall gums. I headed for the southern side of the bluff, knowing there were several Yellow Gums just starting to flower. While not an endemic Tasmanian species, the Yellow Gum euc. leucoxylon (red flowering form), is an excellent bird attractant, with a long flowering period, and widely grown here--I have 3 in my garden. I was not disappointed. As I approached I could see several Spotted Pardalotes, a Crescent Honeyeater, briefly an Eastern Spinebill and a large flock of Silvereyes that erupted from the trees and flew off as I arrived. As I stood in the shelter of the battery's defensive wall and watched the flock of Spotted Pardalotes through my binoculars, I noted first one, then several Striated Pardalotes among them. I was interested to see what the interactions were, as the slightly larger 'Striateds', are often accused of bullying, at least during the breeding season. In fact they appeared to be feeding close together in complete harmony, the only interactions seemed to be among the 'Spotted', and appeared to be males chasing off other males, usually accompanied by a chattering call that I'd not heard before. Every now and again, a few would start to feed on the ground under the gums, and they would quickly be joined by others of both species. They appeared to be feeding on lerps that had presumably been dislodged from the underside of the gum leaves, but they were finding the odd insect too. The arrival of the female Yellow Wattlebird, temporarily caused the pardalotes to fly off, at which point they quickly formed into separate species flocks. The 'Striateds', which had previously been silent, gave a contact call similar to that of the European Greenfinch, as they formed into a flock. The presence of Spotted Pardalotes is often noticed only by their constant calling, as they feed high in the outer foliage of eucalypts, and perhaps the lack of calls by the 'Striateds' may be a factor in the relative paucity of wintering records. I took many shots of both species, as well as the wattlebird, in the sunny breaks between showers. Pardalotes are difficult subjects to photograph when they're feeding in the foliage. They have amazing agility (as the centre shot shows) as they feed, often inverted, on the sugar covered lerps on the underside of the leaves. Pardalotes are among the smallest of Tasmania's birds. Michael Dempsey sent the accompanying photos in. 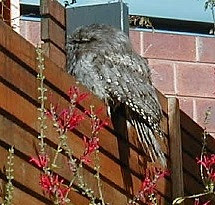 He comments: We have 3 Tawny Frogmouths living about 5 minutes away in the bush in the Knocklofty Reserve (West Hobart). The birds are at the end of the Poet's Road track, in a Native Cherry tree. (he added more precise details which I've omitted). Lots of other birds around, plus it's worth visiting to see the new John Glover painting trial. 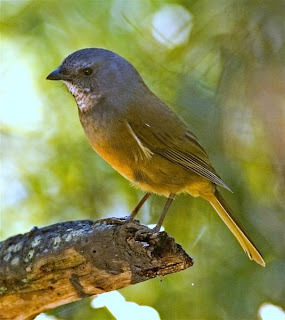 No sooner had I written up Mona's article, than I too added another species for my garden. I glanced out of the kitchen window, mentally lamenting the fact that it was still windy with frequent showers, when I noticed a parting Forest Raven. 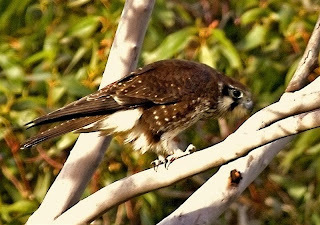 Wondering what had drawn it there in the first place, I suddenly realised that in the same tree as the raven had just left, was the unmistakable shape of a Brown Falcon, and most definitely on the prowl. (A mad dash for the camera ensued at this point, but I had to be content in photographing it through the window). I suspect its interest was in the House Sparrows enjoying the lawn seed my neighbour had 'kindly' sown for them! As you can see, it's a young bird, possibly finding its first Winter a bit hard going in the food stakes. It stayed only briefly, before disappearing towards the unsuspecting sparrows, but I didn't see the outcome. In the past, I've had both Collared Sparrowhawk and Brown Goshawks in the garden, but this is the first "Brownie", although I do see them infrequently, flying over. From previous experience with the other hawks, it will return occasionally during the cold weather. Mona Loofs Samorzewski writes: A few days ago, while deep in a discussion with my husband, Meika, about why he hadn't passed on a message to me about an important appointment that was cancelled that I had tried to go to, he suddenly pointed over my shoulder and said "what's that bird!" I thought it was a desperate attempt to change the subject, but instead it turned out to be a Tawny Frogmouth (pictured) ! It's the first time I've seen one at the Cohousing Co-op where I live, and only the second time I've seen one since I've lived in Tasmania. As you can see it was perched near one of the houses in full daylight. We were wondering if it would be interested in the many Eastern Spinebills that frequent the pineapple sage nearby, and whether it would hunt during the day. Interestingly, that morning I heard many Blackbirds doing alarm calls right in that area, but couldn't spot the source of their concern. 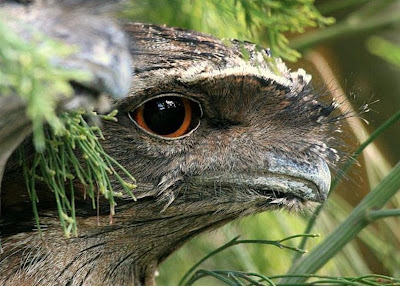 Perhaps the presence of the Tawny Frogmouth explains it. Spotting it has brought my list for the "Cohousing" to 47. I'm constantly amazed that I keep adding new birds after living here for over 7 years. Birding out your window must be one of the most satisfying activities I can think of! Another bird of note here a few weeks ago, was a White Goshawk, perched on one of our guinea pig hutches, two days in a row. Another person who lives here had the best views, I only caught the occasional glimpse, but later had a good sighting while walking to the South Hobart Primary School. I haven't seen them much in this area before, Has anyone else noted them flying over South Hobart? Meika and I also saw a pair perched above a chook yard near Longley at the weekend. It's funny how sightings of birds go, I hadn't seen a White Goshawk at all until this year, and now I've seen them three times in the space of a few months. Over the weekend I made an early morning start to look at Gould's Lagoon. As I neared 'Gould's", I realised that the lagoon would be covered in an early morning fog and diverted to the nearby Derwent Marshes. As I drove towards the Bridgewater Bridge from Granton, I noted a flurry of activity over the water and pulled off to investigate. Almost immediately I spotted a White-breasted Sea Eagle being noisily pursued by 2 Kelp Gulls. Thinking that this might prove to be a photo op. as the eagle was getting ever closer, I took my eyes off the action to pick up my camera. This proved to be a mistake because when I looked back, no eagle! I got out of my car and scanned the area with my binoculars. The conditions were very still with low sun penetrating the thin mist over the water. While scannin g, I noted a number of cormorants on an old river washed tree that had grounded in the shallows several hundred metres away. As I looked more closely, I realised that there were several Great Cormorants nests, some with sitting birds (see photo). It's not that unusual for them to breed in the Winter months, and I've recorded them doing so in the Derwent Marshes before. I assume that the timing of their breeding is tied to the availability of suitable food resources. I have seen a general increase in the numbers of Great Cormorants around the Hobart area recently, many of them immature birds. Just as I was getting back into the car, the Sea Eagle reappeared, floated across the water, picked up something off the surface and flew back. Never quite close enough to get the sort of shot I was after, I took a shot anyway, as you can see. This time I kept my eyes on it. 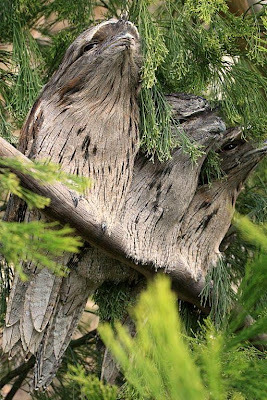 It alighted in a large pine tree on the river bank overlooking the marsh and it then became clear that this is where it had 'disappeared' to earlier. Interestingly, although the eagle flew close to the cormorants, they seemed unfazed. This probably indicates that they're sitting on eggs, as I imagine there might be a different reaction from them if they had young. A decent morning for a change! I opted for a long overdue excursion to Snug Falls. Well I say overdue, but I can't ever remember visiting this site before. I've certainly birded the general area, just never visited the falls. It's accessed by a track from the road that passes through country that starts off being almost heath and gets ever wetter as you descend, until you reach the valley floor where it's virtually rainforest, with many tree ferns lining the creek. The trip to the falls takes about 20 minutes from the road. The bad news is that it's all uphill coming back, but hey! I was passed by a young woman with a child in a push chair, although I wouldn't recommend anyone emulate her! By far the commonest bird in here at the moment is the Eastern Spinebill, I recorded them from the track start to nearly the valley floor, undoubtedly drawn here by the pink and white flowering Common Heath Epacris impressa, that's prolific. A few flowering Banksias attracted mostly Crescent Honeyeaters, and a few Brown Thornbills. About halfway down I came onto several groups of Strong-billed Honeyeaters (photo lower right)., mostly feeding on the trunks of eucalypts. It was while I was photographing the Strongbills, that a solitary Olive Whistler appeared among the foliage of a nearby Native Cherry. Eventually it fed closer, occasionally dropping to the pathway. This is only the second time I've managed to photograph this whistler. It's not that it's uncommon, just that it generally keeps to the thicker scrub. Although the light wasn't great for photography, I eventually got the shot at top right. At times it came almost within arms length of me, but always in cover. As I descended further I passed a small flock of Tasmanian Thornbills, a few Tasmanian Scrubwrens, and several Grey Fantails. The latter were mostly feeding on the track, possibly because the cool morning had 'grounded' much of the insect life. The valley floor produced little bird life, but the falls are worth the walk. I guess they're about 20 metres or more high and no doubt in full flow they look spectacular. Other species noted on the walk included Green Rosella, a lone male Scarlet Robin, a few Grey Shrike-thrush, Superb Fairy-wren, and Yellow-throated Honeyeater. I would expect to find Scrubtits and Pink Robins around the valley floor, and possibly White's Thrush. Not a large list, but worth the visit. A trip to this area could complement a visit to the Peter Murrell Reserve at Kingston, only a few kilometres away, for those looking for Tasmanian endemic species. To get there, turn right (as you head South), at the school in the centre of Snug and take the left fork at the next junction. The road is virtually single lane and for the most part unsealed, but there are plenty of passing bays, and the car park is signposted.